KNOXVILLE, Tenn. – May 24, 2018 – Studio Four Design, a top Knoxville-based architecture and design firm, helped Premier Eyecare and primary optometrist Dr. Brent Fry achieve their business visibility goals by designing a striking and spacious retail center with leasable space and room to expand. 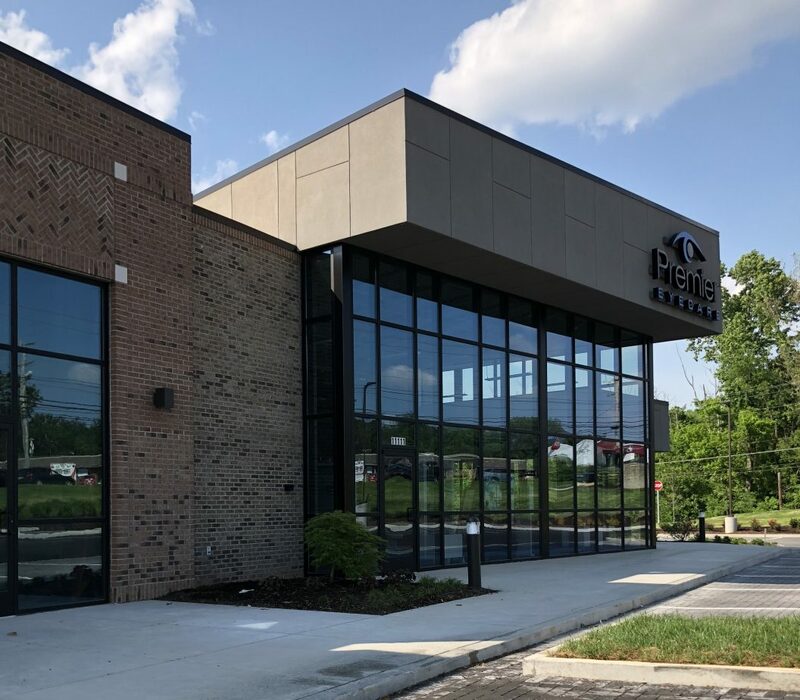 Premier Eyecare, a longtime optometry center in the Farragut community, was previously located at a site that wasn’t conducive to walk-in business. Positioned below road level, behind trees and with only small windows, the setting almost concealed the eye care center from potential patients. In 2016, Dr. Fry approached Studio Four Design with three primary goals: achieve better visibility, have room to expand and provide a large retail showroom. Studio Four Design, tasked with achieving Premier Eyecare’s goals within a modern, semi-industrial environment, set about designing an 11,000 square foot structure. Half of the space, 5,500 square feet, was designated specifically for Dr. Fry and the Premier Eyecare team, and another 5,500 square feet is leasable space. To highlight the beautiful retail showroom, they incorporated 24-foot-high windows to maximize natural lighting. The design team was able merge modern elegance with traditional warmth by integrating a mixture of brick and glass, high ceilings and exposed beams. Premier Eyecare has proudly served the West Knoxville and Farragut communities since 2002. Dr. Brent Fry, optometric physician, and his experienced team are dedicated to providing only the highest quality of personalized eye care products and services to their patients through uncompromising attention to detail and state of the art technology. Offering services such as LASIK co-management, corneal refractive therapy, contact lenses, and comprehensive and medical eye exams, as well as providing an expansive showroom featuring the best in eyeglasses and eyecare products, Premier Eyecare pledges to “serve all of your family’s eye care needs under one roof.” For more information, visit www.premier-eyecare.net. Published on May 24, 2018 by Ripley PR.